It is reliably learnt that the IDA rate has increased by 4.2% from 67.3% to 71.5% w.e.f.1.1.2013. It is proposed to conduct the Executive Body Meeting of HTD on 9th January 2013 for which AGM(Admin) has sanctioned special C.L to the Executive body members. The venue and time will be intimated shortly. All the members are requested to attend with out fail and are also informed to bring forth the issues and points that require attention. Provisional eligiblility for applying & appearing in examination to be held for direct recruitment of DGMs in BSNL. Today Hon’ble PCAT, in an application filed by AIGETOA through its General Secretary, has allowed the members having requisite qualification/experience with Gross salary approximately Rs.7 Lacs per annum to be provisionally eligible for applying and appearing in examination to be held for direct recruitment of DGMs in BSNL. The interim relief has been granted by the Hon’ble PCAT in line with the order passed by Hon’ble CAT Chandigarh on 17th December 2012 in an OA filed under guidance of AIGETOA CHQ at Chandigarh . Copy of the orders shall be uploaded shortly. Members those who passes 12 years of post qualification service including previous service other than BSNL and having basic approximately Rs.25000/- as on Aug 2009 are requested to fill in the hardcopy of the application form and send it along with the covering letter (Click here for the Format) and necessary enclosures to the following address by Registered/Speed Post so that it reaches latest by 26th December 2012. Members/Candidates may submit one copy to their respective administrative offices through proper channel also. It is reliably learnt that hon. CAT New Delhi has given provisional eligibility to all candidates who are having 7 lac CTC ,( Instead of 3 years Exp. in E4 scale ). DS & DP met Resp. PGM-HTD and DGM - Admin regarding the clearance of pending request transfers from HTD-Rural to Urban and the posting of relievers to the already issued transfer cases. PGM responded positively and assured the clearance of cases at the earliest. OA filed by some members of AIGETOA under direction of AIGETOA CHQ at Hon'ble CAT Chandigarh came up for hearing today and Hon'ble CAT has granted provisional eligibility to the applicants for the DGM recruitment. Similar case is filed at Hon'ble PCAT Delhi in the name of AIGETOA for its members, final hearing of which is scheduled to be held on 2nd Jan-2013. Further details and action to be taken will be uploaded shortly. Sanction working and Vacancy position in JAG/STS/SDEs/JTOs of AP Circle given in AP Circle Website. 44 Members of AIGETOA Maharastra files case in Hon'ble CAT regarding EPF anamolies. Parliament march at New Delhi and Massive Demonstration at all Circles/ SSAs on 22nd Nov 2012. Live web-cast can be viewed from 12.30 Hrs at CHQ website. Joint Forum of BSNL/MTNL Unions/Associations is organizing Parliament March at New Delhi and Massive Demonstration at all Circles/ SSAs level on 22nd Nov 2012 to protest against the discriminatory attitude of the DOT administration, BSNL/MTNL Managements towards BSNL/MTNL employees. JOINT FORUM Demands to relieve all Non-opted ITS officers working in BSNL/MTNL on deputation OR Take all BSNL/MTNL Employees back to Govt Services. It is reliably learnt that the LDCE case in PCAT delhi has been posted to 12th december-2012. Further details will be uploaded soon. MOU Has been signed with INDIAN BANK for extending special Loan package for the Employees of BSNL for the period from 26.05.2012 to 25.05.2013, where the bank is offering various loans like Housing Loan, Vehicle Loan, Personal Loan, Educational Loan and Clean Loan at an interest rate of 0.5% less than the existing Bank rates. It is reliably learnt that todays LDCE case in PCAT Delhi has been posted to 21/11/12 for next hearing. Details will be uploaded soon. AIGETOA Congratulates our member Sri K. Gangaraju of ITPC Pune Circle working at Telephone Bhavan, for receiving VISHISTHA SANCHAR SEVA PADAK Award 2012 (Circle Level) in Executive cadre -I. He will be awarded Rs.21000.00 cash prize, a Silver Medal and citation from the SSA Head. As per the call given by the CHQ for the lunch hour demonstration against DGM RR, HTD responded with full strength. The program was led by Circle secretary Shri Laxman, ACS Shri Srinivas and DS Shri G.Satish. More than 100 members have participated in the demonstration at CGM office between 1.00 to 2.00 PM. Slogans were raised against DGM RR and BSNL Management and DGM RR notification papers were burnt . Hats off to the members of HTD who turned up to the program with in a short notice. An emergency meeting of HTD executive body is scheduled on Monday,15/10/12 to discuss the next course of action on LDCE and some vital issues which require immediate attention. Venue : Asman mahal Quarters at 16 : 00 Hrs. Plse make it convenient to attend. The DPC for timebound upgradation from E1-E2 & E2-E3 of remaining members(JTOs and SDEs) from HTD has been completed. The list has been sent to circle office for approval. We will try to get the order released at the earliest. Hon'ble CAT Hyderabad has vacated the stay on LDCE postings. Congratulations to our dedicated legal team from AIGETOA Hyderabad who have impleaded and got the stay vacated with in Two weeks from the date of implead. They tirelessly pursued the issue and brought it to a milestone. This further strengthens the fact that AIGETOA HTD will do what ever it takes for the welfare of its members, and the responsibility lies on us members to strengthen the Association by active participation and funding. It is humbly requested to the LDCE Qualified members to contribute Rs.2000/- towards legal fund of AIGETOA HTD at the earliest, which will be used to clear the remaining hurdles in the way of SDE postings. BSNL announces offers for consumers on its 12th anniversary. It is reliably learnt that the IDA hike for the quarter starting Oct-12 is 5.8 %. BSNL Launches Pan India Unlimited Night Call Plan – Rs.59 For Landline Customers. The legal team constituted by CHQ on LDCE issue is having meeting in delhi as per the scheduled agenda from 15.09.2012. Our Vice president from HTD Mr D.V Ramanjaneyulu had participated in the discussions and stayed in delhi from 15.09.2012 to 19.09.2012. He is the only representative from AP as well as from entire south india to participate in the meeting. The meeting is still going on and may be concluded with in a couple of days. We congratulate Mr. Ramanjaneyulu for representing from hyderabad by sacrificing his four personnel E/L's and of course his precious time. The details of the meeting will be discussed in the HTD Executive Body meeting soon. It is reliably learnt that the hearing on LDCE case at PCAT, Delhi has been posted to 10th october-2012. It is reliably learned that Hon’ble CAT Hyderabad has postponed the case for stay on promotion of SDE through LDCE by three weeks on request from BSNL . 1. Canvassing of new broadband plans and the requirements for the same like shortage of VDSL cards, Remote DSLAMS, manual intervention in port changing at DSLAM end etc. were discussed. 2.Requirement of OF cable,jointing kits and equipment, vehicle mileage issues of transmission wings,need to procure new splicing machines and OTDR's were projected. Need to increase the transmission teams in view of the growing OF network and maintenance issues due to the ongoing metro works were discussed in detail. 3. Hurdles in bringing new EB leads due to shortage of PRI modems, delay in executing the leads,problems with exixting FTTH technology were discussed. 4. Appoinment of nodal officer at PGM office to monitor the sale of RUIM cards so that the existing CDMA network can be used at its best. Need to appoint the RM's in rural areas to increase the sale of SIMs, connectivity issues of 3G data cards, posting of TTA's in Cell BTS O& M wings to have a regular monitoring of the cell Sites were put forward. 5. Introduction of CUG plans for Landlines in hyderabad to arrest the disconnection trend and also to increase their demand in future. 6.Some other relevent technical details were also discussed in brief. The meeting was held in a good atmosphere and PGM responded positively on many of the issues and told us to work hard to increase the broadband connections in the ongoing Broadband Badshaw Scheme. We thank PGM-HTD and GM(CM) for sharing their valuable time inspite of their hectic schedule. Agenda meeting with PGM-HTD on issues like FTTH, Enterprise Business, Transmission Planning , Broadband, Consumer Mobility e.t.c has been confirmed on 06.09.2012 at 11.00 A.M. Please mail your problems on above subjects to aigetoa.htd@gmail.com at the earliest. Felicitation of Sr.GM(HR & MIS)-HTD, Sri.Ganapati Ram garu by AIGETOA-HTD. Retirement function of Sr.GM (HR & MIS )-HTD, Sri. Ganapati Ram garu was organised by the executive staff under HR,MIS & Plg wings. AIGETOA-HTD used this oppurtunity to felicitate him. We, the DR community in HTD owe a lot to him ,the way he encouraged and guided us. He was the man who understood the pain of JTO's working in HTD-Rural and issued long pending trasfers to Urban in a single stroke, inspite of so many hurdles and thus paving the way for a smooth rural transfer policy. The DRs in HTD could get EPF balance slips till date because of his intervention in the matter and pressurising the Finance wing. We also thank him for clearing the proposal for empanellment of childrens hospitals and sending the file to CGM office in a very short time. Our Exec. Body felicitated him by honouring with a shawl( By the hands of PGM ), a flower bouquet and the momento (Idol of Lord Venkateswara ) by the hands of Resp. CGM. We thank DGM-Admn for giving us this privilege. We wish him a Very Happy, Prosporous, Peaceful, Healthy and Wealthy retired life. It is reliably learnt that BSNL Board has approved the decision on the implementation of 78.2% IDA fitment benefit, now it will be sent to DoT for issuance of Presidential Directive. DS along with Circle secretary had a ameeting with CGMT-AP this evening and had more than an hour long discussion on EB,FTTH,Transmission and Cellone issues pertaining exclusively to HTD. CGM responded positively on all the issues. We also thanked him for getting new broadband plans for HTD. DS, Sri.G.Satish along with DVP Sri Ramanjayulu,Narender, DS Chaitanya , Bhasya ( JTO Udan) and Srinivas met DGM (Task Force) Sri .V. Venkateshwarlu and thanked him for getting new broadband tariffs exclusively for Hyderabad. Other relevant issues like planning of remote DSLAMS, shortage of VDSL Cards/ Modems, FTTH issues were discussed in detail. There are almost 13 cases filed against the LDCE promotion through out the country and all the cases are based on ambiguity on question paper. Every individual has right to approach the court of law for seeking the justice but ultimately decision on ambiguity of question will be taken by the Expert Committee based on the facts. BSNL has already imprinted the process to address such grievances and none was deprived in this process. Still many candidates have approached to the court of law and succeeded in getting stay on the promotion through LDCE. What is surprising that BSNL management has so far not been able to defend any cases which show the stance of BSNL management on executive’s promotion. Applicants have been able to differ the case citing various misc reasons such (medical or computer problem) and BSNL layer could do nothing. GS and other CHQ members are continues in touch with CMD BSNL and other concern authority. It is difficult to follow up the cases in different court and different places hence BSNL has filled the appeal in principal CAT to get clubbed all the cases at Delhi which has been admitted and notice is already issued to all. Now, what is required is that how fast these cases can be transferred to Principal CAT. All these matters are now in knowledge of honorable CMD BSNL and we expect he will give top priority and certainly will be able to finish all the hurdles within this month. It is reliably learnt that the that Honorable CAT Guwahati has postponed the promotion of SDE through LDCE case till 11 September 2012. Further information will be posted soon. It is also heard that the petitioner has not filed any rejoinder today . Circle body meeting is scheduled on 16.09.2012 (Sunday) to discuss the plan of action on CPSU Hierarchy. Circle office has approved the up gradation of few broadband plans and introduced new Broadband plans exclusively for HTD Area with effect from 01.09.2012. There has been a considerable increase of speed and usage limit, which is summarized below. All the concerned JTO's and SDE's may please send in your reviews and comments to aigetoa.htd@gmail.com about the plans at the earliest by 18-08-2012, so that the same may be conveyed to PGM office. Please try to attend tomorrow's Independence Day Celebrations at BSNL Bhavan, where PGM -HTD will hoist the tricolor at 09.00 AM. Try to reach by 08.30A.M .Do inform the same to all our friends. 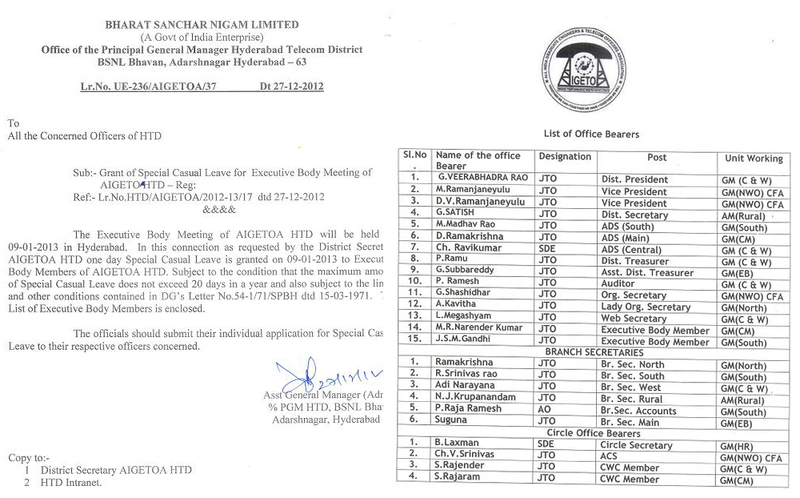 List of JTO's due for 1st or 2nd Time Bound Promotion whose CR's have not reached the AGM(Admin) PGM Office. All the JTO's/ SDE's who are listed are requested to make arrangements to send their CR's, Special Reports and E1-E2 completion certificates to AGM(Admin) O/o PGM HTD. 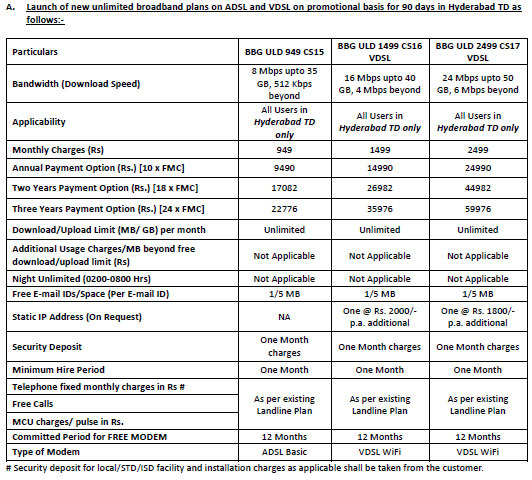 BSNL Introduces Ramzan & Id-ul-Fitr Special Offer for all circles- Enjoy multiple benefits on STV786Submitted by admin on Sat, 07/21/2012 - 11:00On the auspicious occasion of Ramzan and Id-ul-Fitr, BSNL has introduced a special Full Value Prepaid Voucher ‘786’. On recharge of Rs. 786 customers will get talk time of 786 Minutes (Local / STD) to all networks, 786 MB Free 2G/3G Data usage and Free 786 Local and National SMS valid for 90 days. This offer will be available from 23rd July 2012 valid up to 22nd August, 2012. It is reliably learned that Hon’ble CAT Hyderabad has admitted the case for stay on promotion of SDE through LDCE, and the hearing is after two weeks. The hearing of case at Hon'ble CAT Guwahati has been postponed to 17th August, 2012. In the Executive Body Meeting, DS, HTD Sri.G.Satish has spoken to General Secretary AIGETOA Sri.R.P.Sahu via Audio Conference, where he has assured that the Association will put pressure on Management to get the stay vacated at the earliest. He has also hinted that an agitation program may also be chalked out to hold liable those responsible for the gross ambiguities in the LDCE Exam paper resulting in so many court cases. He has also requested members and others to refrain from approaching courts, as this will delay the process and assured that the next LDCE will be conducted in a much shorter time than expected. AIGETOA Hyderabad Executive Body Meeting was conducted in a grand way at RTTC Hyderabad on 07th August 2012 at 11.00 A.M on wards, which was attended by Executive Body Members of HTD, Circle Members, CWC Members and other's from HTD, Cell one and RTTC. The meeting was chaired by District President Sri. G. Veerabhadra Rao, District Secretary Sri.G.Satish, District Finance Secretary Sri. P.Ramu and Organizing Secretary Sri. G.Sashidhar. Circle Secretary Sri. B.Lakshman, ACS Sri.Srinivas , CWC Members Sri. Rajender and Sri.RajaRam were also present. AIGETOA CHQ BODY President Sri. N J P Shilohu Rao was also present for the occasion and has shared his views and information about career progression in BSNL, Fixation of seniority, roster, LDCE and postings. Collection of Rs.1000 from LDCE cleared members towards CHQ fund. The performance report of the Executive body was delivered by the Dist.Secretary Sri.G.Satish where he enumerated the tasks taken up by the district body which involved perusal of transfer cases, EPF issues, Children Hospitals, special C.L's. Dist Finance Secretary Sri.P.Ramu has given a detailed report on the financial health of the Association at District level and the expenditure incurred there in. He also emphasized that the funding have to be voluntary and only through the fund contribution the performance of the Association improves. An interactive session by the AIGETOA CHQ BODY President Sri. N J P Shilohu Rao had taken place where he spoke at a lendth and enlightened us about career progression in BSNL, Fixation of seniority, roster, LDCE and postings. He also said that various vacancies of ITPC, AP , STR, STP, T&D, Q/A should be identified at AP level and HTD level so as to accommodate as many candidates in AP as possible. The circle issues were illustrated by the Circle secretary Sri. B. Lakshman, where he appreciated the functioning of the Executive Body of HTD and also cited that the same vigor and enthusiasm should be brought into the circle level. He encouraged the younger batch JTO’s to come forward to take the reigns of the association and play an active part in association. He quoted “being a leader gives a lot of satisfaction as it gives us an opportunity to help those who could not help themselves”. Dist Vice President D.V.Ramanjaneyulu discussed about the post promotion preparation where he insisted all members to clear their pending issues like E1-E2, E2-E3 , CR’s special Reports , EPF transfers as soon as possible so as to avoid hassles at later stages. The following Resolutions were taken in the Meeting by the members. It is resolved that ECS facility for monthly subscription of union fund should be completed by office bearers by the month end. It is resolved that the Union Fund collection for the period from May12 to sep 12 should be taken up to strengthen the Dist Body branch wise. It is resolved to Invite the new members from all batches and all active members should be allotted suitable roles. It is resolved that a CHQ fund of a minimum of Rs.1000/- from the members who have cleared LDCE should be collected to support legal funding. It is resolved that Inclusion of Children’s hospitals in empanelled list of hospitals in BSNL, to be finalized by the month of September. It is resolved that E2-E3 pending cases of HTD to be pursued and cleared as soon as possible by submitting the required documents in correlation with the staff/admin section. It is resolved that the forthcoming Circle AGM to be conducted by sep2012. It is resolved that the lady executive membership shall be at least 20% in the executive body to achieve active participation of women employees in the association. It is resolved that the Formation of a Technical Team to support BSNL operational issues in the field EB, Cellone, and other spheres is necessary, so appropriate action has been launched, which is headed by Sri.Ramakrishna and team. It is resolved that a BSNL growth team is also to be formed, which will identify new vistas for growth of BSNL services and revenues. It is resolved that the old bank accounts to be closed and funds to be transferred to new kotak mahindra bank, Banjara hills. Special C.L granted to all the Executive members of HTD, D.S Sri.G.Satish is pursuing the same for Cellone and Circle office members too. D.S has requested all the executive body members to be present at the seminal hall at exactly 10.30 A.M or before so as to utilize the time effectively. It is reliably learnt that BSNL Management Committee in its meeting held on 01.08.2012 has approved the proposal of 78.2% IDA fitment benefit to BSNL employees. Now the MC approved proposal will be sent to next BSNL Board Meeting, which is expected to be held in the last week of Aug'2012. Kindly register your self in "http://members.epfoservices.in/" for EPF updates and online view of EPF Account passbook and other services offered by EPF India. DS & DP along with DVP-Rural met PGM-HTD and discussed about the irregularities in posting of DR-JTO's in HTD-Rural. PGM responded positively and assured that he will look into the matter. DGM-Admin was also appraised about the matter. AGS(CHQ), VP (CHQ) and DP New Delhi circle along with GS SNEA and AGS SNEA met PGM (SR) and expressed the strong displeasure of the association side on the slow progress of the committee. The next meeting of the committee is proposed to be held on Tuesday, the 10th July 2012. Some members have represented against the less marks shown in the LDCE result published on 12/06/2012 w.r.t. final answer key. It is learnt that this has happen due to some reading mistake of OMR machine. There is no need to worry as their OMR answer sheet is being manually examine and modification in marks is expected shortly. This association is following up the cases - Hence check your keys once again. It is to request and remind all the Circle Secretaries of AIGETOA to ensure 100% vigilance submission of the LDCE passed executives to the corporate office. There is no need to worry about the stay on promotion based on LDCE-2012. AIGETOA CHQ will take up all the hurdles once vigilance reached to corporate office from all the circles. 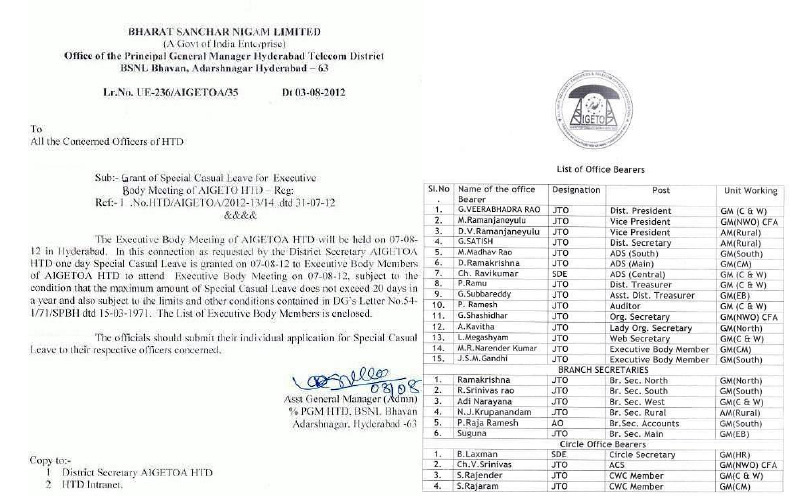 A total of 106 JTO's from HTD has cleared LDCE-> List put up by PGM office,HTD on 28.06.2012 in HTD intranet. Corporate office has circulated the list of Sanctioned and working strength in TES Gr. "B" cadre to all the circles for confirmation and correction >> click here for the circular. Ramu-AFS along with Pavan & Gandhi attended the meeting with GM(ITPC) which was headed by PGM( HTD). The pending issues in CDR were reviewed. On hearing of OA 171/2012 filed by member of promotee association, Hon’ble CAT Guwahati Bench granted stay on promotion of SDE through LDCE conducted on 4/3/2012. The objection letter format for the all India eligibility list is to be served to the administration section. It is very important for the 2001-02 batches to serve the objection letter without fail especially those who are not successful in the LDCE. The JTO's from the 2005 and 2007 are also requested to submit the objection letters. B.Laxman-CS,G.Satish-DS and Srinivas-ACS met GM(HR), Circle office Sri.B.Jagadeesh Kumar and appraised him about statistics of the huge number of JTO's from A.P circle and HTD who have successfully qualified the LDCE 2012 exam and are eagerly waiting for circle allocations. G.VEERABHADRA RAO-DP met with Sri.G.Raja Rammohan, DGM(A) HTD regarding the request transfer of G.Sadanand, JTO(Mdcl) on medical grounds. He has responded positively and assured that the request will be considered at the earliest. ADS-North/ South/ Central &West/ Main/ CELLONE/ RTTC/ CO/ STP/ STR..
All the LDCE 2012 successful candidates of A.P.Circle those who are willing inter-circle transfers and intra ssa transfers, please fill in the information below as completely and accurately as possible within 3 days i.e latest by 22nd June 2012, Friday..
Any discrepancies may please be brought to the notice of Megha shyam, 9490747500. On one side, with the systematic pursuance of AIGETOA at all levels, LDCE results have been declared and most of the members who appeared for exam have qualified for promotion to SDE(T). It is observed that members have been benefited by some 9 marks due to the continued and systematic effort of our association. Our CHQ team at BSNL CO was always on alert and any roadblocks observed were suitably taken care of. We are also thankful and grateful to our CMD and Director (HR/EB) who were considerate enough to realize the importance attached with the declaration of result and took personnel initiative to ensure that the results are declared well before the time estimated by others. GS has spoken with CMD BSNL in regard to the posting of the newly promoted SDEs. CMD was of the view that newly promoted SDEs should be given training on latest technologies to hone their skills further. Association further requested for posting of interested officers in Data centers so that dependency on vendors can be minimized. In the view of positive assurance given by CMD, BSNL the forum of BSNL Unions/Associations agitation call of indefinite strike w.e.f. 13th June'2012 is deferred on a written agreement reached between BSNL Management and the representatives of Forum. ----Morning hour gate demos. were held at Lingampally( Headed by MeghaShyam BS ). ---- Lunch hour gate demos. were held at BSNL Bhavan( Headed by DP) & Telephone Bhavan( Headed by Shashidhar,OS). ------Milestone acheivement - AIGETOA_HTD Branch formed in BSNL Bhavan with cent percent attendence. Thanks to Ramakrishna ADS for the Initiative. ----Morning hour gate demos. were held at Gowliguda ( Headed by Rajender CWC member with more than 40 members) and Patny (Headed by Ramakrishna BS, with more than 100 memebers). ---- Lunch hour gate demos. were held at Charminar( Headed by Madhava Rao DVP, with more than 200 members). 10/6/12-AP circle CEC meeting was held at hotel Wood Bridge ,Masabtank. The meeting was attended by CS,Srinivas-ACS, Satyavardhana Rao- AGS(south),DS&DP of HTD and other SSAs,HTD Exec. memebers and other circle exec. memebers. HTD members marked their presence by giving their valuable views. Issues regarding CHQ-CWC meet,fund were discussed. 10/6/12- S K Satyarthi, CGM KolKata was arrested late on Saturday night while allegedly accepting a bribe. For more news click here - source-Times of India. 8/6/12- Morning hour gate demos. were held at Erragadda,Ameerpet,CTO Secunderabad( Headed by Verrabadhra rao-DP, Ramanjaneyulu-DVP, with more than 40 members)and Musheerabad(Headed by DS, with more than 70 memebers). 7/6/12.- Morning hour gate demos were held at Tolichowki( Headed by Ramanjaneyulu-DVP, with more than 80 members), Jubli hills(Headed by DP, with more than 100), Kavadiguda(Headed by DS, with more than 70, Vanasthalipuram(Headed by Gandhi) & Lingampally. 7/6/12- A disproportionate assets case has been registered by the CBI against the GM,Rajahmundry. Source- The Hindu,For news Click here..
6/6/12 - Grand Success... The full day dharna at BSNL Bhavan was attended by more than 400 members.It was a very encouraging presence of AIGETOA with their presence of nearly 70. lets maintain the same tempo for the indefinite strike from 13/6/12. 5/6/12. - Meeting of FORUM of BSNL UNIONS/ASSNs held in BSNL BHavan in which all the CS's attended. It was decided to hold full day dharna at BSNL Bhavan on 6/6/12. A plan of action was chalked out to mobilise the members in every corner of HTD by conducting Morning/Lunch hour demonstrations in important stations as follows..
7/6/12- Morning Hour Gate Demos -Tolichowki, Jubli hills, vanasthalipuram, kavadiguda. Lunch Hour - CTO-Hyd, Ameerpet, CTO-Secbad,Malakpet. Lunch Hour - Charminar, Tirumalgerry. 12/6/12- Lunch Hour - BSNL Bhavan, Tel.Bhavan. All the members IN and Nearby Stations are requested to join the their counterparts and make it a grand success. 4/6/12 - DS & DP along with Ramanjaneyulu (DVP) & Narender (WS) met AO-central & DGM( F&P) regarding the long pending issue of Pay Anamoly of JTO's in GM(C&W) area and expressed our dissapointment reg. the delay in implimenting the same. DGM(F& P) assured that the matter will be settled by next week. DS & DP along with Ramanjaneyulu (DVP) met DGM(Admin) regarding consideration of pending rural transfers. The status of empanellment of childrens hospitals was discussed. The file is under process. DS & DP along with Ramanjaneyulu (DVP) met CS in his chamber and discussed about the course of action in the event of ongoing agitational programmes, circle meeting and conference in Bangalore on 16t & 17th of July. 30/5/12- As per the call given by the CHQ,Extend total support to Tomorrow's program by attending in large numbers in the Demonstration at Circle Office on 31-05-2012 organized by Forum of BSNL Unions / Associations.Please educate and mobilise the members against the injustice being done. Visit aigetoachq.org for details. 26/5/12- DS & DP along with Ramakrishna ADS, Ramu FS, Subbarreddy AFS met Sr.GM Muralidhar garu and congratulated him with a bouquet on taking charge as PGMHTD . We assured full fledged cooperation from AIGETOAHTD for all the developmental activities. 22/5/12- BSNL likely to get Rs 6,000 crore package for Naxal-area rollout. 05/5/12 - DS & DP met DGM(Admin)-HTD and requested to consider the pending request transfers from Rural and Urban areas and also to post the relievers for the JTO's for whom transfer orders have already been issued. Some 35 JTO's are expected to join HTD in the coming 2 to 3 weeks. All the members are requested to persue with their admin sections and get thier CR's forwarded to PGM office along with the Special reports and also submit the certificate/relieving orders of E1-E2 upgradation training at the earliest.